You read the heading and probably wondering are we cooking soup for our hair again????? It seems like we naturals are constantly feeding our hair with food we should be putting in our mouths! The alternative though is purchasing ready to use hair products from the shelf....but why do that when you have perfectly effective products in your kitchen?? ?Why hunt for fancy deep conditioning hair masks all over Nigeria that may contain a tiny percentage of the hair friendly natural extracts when you can find them in your kitchen and for a fraction of the cost? In a popular Nigerian quote, " Why go to Sokoto when what you are looking for is in your shokoto???" Well, here's a deep conditioning treatment that can be found in our shokoto! I've been hearing all about it and how wonderful it makes dry crunchy hair feel but I can't remember why I never really bothered trying it out...oh...I remember now. b) Palm oil is known to be one messy oil whose stain you can't get rid of easily....but so is henna, indigo, zobo and hair dye...so no excuse there! c) I was waiting for someone else to be the guinea pig for a change...lol! So it was with joy I received this fabulous tried and tested recipe from a Nigerian naturalista and veteran blogger, Alfreda! P.s. 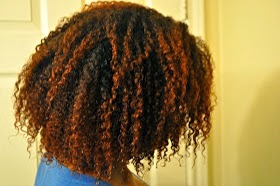 I love how we, naturals don't hoard our secret tips to fabulous hair....go naturalistas!!!!! Here is her secret recipe for treating 'frizzy, dry as a desert and so will cut you to pieces' hair. Red palm oil contains lipids and saturated fats that feed the hair shaft, eliminating dryness. The moisture beads in palm oil improves the texture of your hair by making it soft (to touch) and strong (to withstand manipulation). Shea butter or EVOO to seal in after application. I cleansed my hair with shampoo, put my hair in 4 sections, and applied the mixture while finger detangling(my hair was already detangled prior to this, but I find that finger detangling clumps my curls, and reduces frizz) . 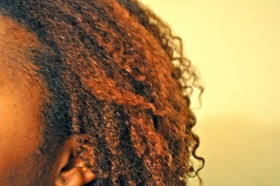 Then I coated the hair with my shea butter mix. I deep conditioned overnight for about 6 hrs. Then I rinsed with cool water and didn't apply any more products after that. Do you notice her fabulous colour??? Hmmm...I seem to show off red headed naturals o! This looks like the perfect DIY conditioning for color treated hair too. So no more fears about breakage due to dryness after getting a dye job. Have you tried this? Did you love it, hate it or were 'meh' about it? I just love when we use our own locally acquired stuff. I just feel God knows why he made certain things grow in certain places. They may be the best thing for people living in that particular area. Just my thought sha. I agree. God shared good gifts equally it seems! That will be less messier because it's quite hard to remove banana chunks if the baby one is unavailable! Yeah I tried it last year when I was transitioning and I LOVED the result. My hair was incredibly soft. Definitely trying it again especially since I'm about to color my hair. So the palm oil doesn't wash off completely? After the rinsing it off and sealing your hair, can it still stain your clothing? No it doesn't if you wash it off well with water. 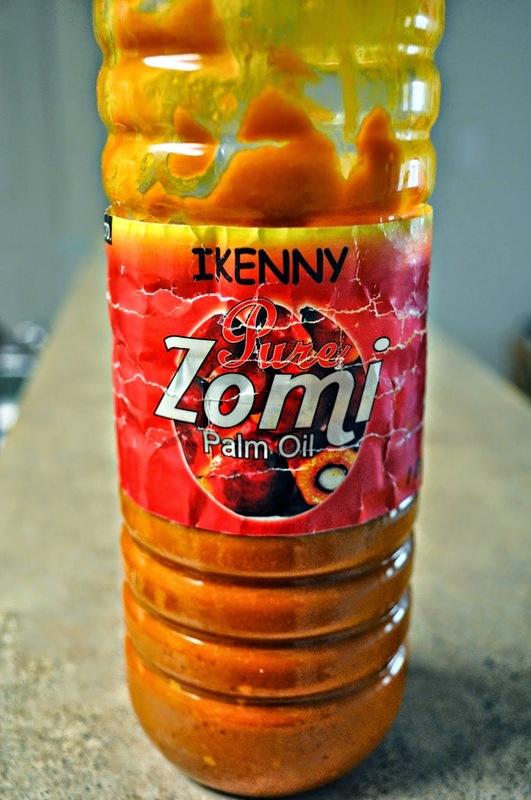 Does the palm oil color your hair permanently? Does it loosen the hair pattern? 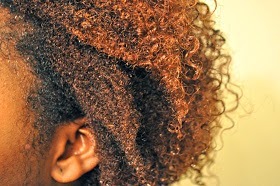 No, palm oil doesn't color hair permanently or loosen curl pattern. It keeps hair well hydrated and soft. When do u apply the mixture, before or after conditioning? Hi Twinkle, Freda used the palm oil in place of the conditioning and deep conditioning step. Then she rinsed with plain water and sealed her hair with shea butter. No more steps before and after that save for shampooing prior to applying the palm oil. i couldnt get all the oil out. Try cowashing it out and if you don't like how it feels, you can try rinsing it with very dilute shampoo.